Two CIID students develop a water-supply system suited to a nomadic, water-stressed future. Water scarcity is one of the biggest challenges the world faces. At present, 1.2 billion people–one-fifth of the world’s population–live in areas where water is in short supply; by 2025, according to the United Nations, that number will grow to 1.8 billion. How we’ll cope with the impending crisis on a macro level remains to be seen, but small-scale solutions abound. 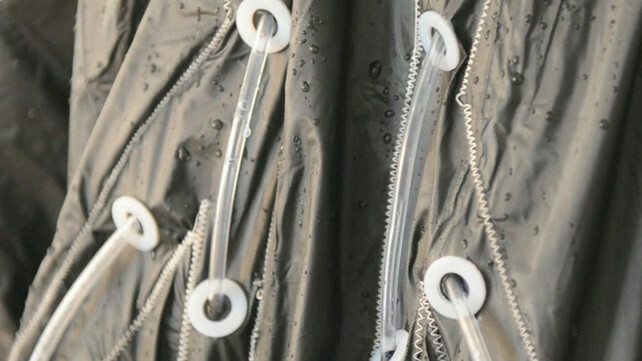 A project at the Copenhagen Institute of Interaction Design, by master’s students Joshua Noble and Hyeona Yang, for instance, allows people to store and filter rainwater for drinking using the jacket on their backs. “We chose to work with the idea of a possibly not-so-distant future in which rainwater would need to be filtered before drinking and how that could be done for a hiker, nomad, or simply the momentarily infrastructure-independent wanderer,” Noble tells Co.Design. Raincatch works by collecting rainwater in its collar. The water then passes through a purification system of charcoal filters and iodine pouches before being distributed among various internal pockets, which, the designers say, mitigate imbalances and sloshing. The wearer can take a sip through a straw connected to a network of tubes woven into the coat. Noble and Yang designed the jacket so that the filters and iodine pouches could be replaced; the jacket itself is plastic and can be easily wiped down with or a cloth or disinfected with a spray. Other manufacturing concerns, such as durability and eventual wear, fell aside due to the short project timeline. The wearable-technology approach to water supply reminds us of another concept proposed a few years ago by the architect Eric Olsen: a pleated bucket designed to hold up to 20 liters of water and be carried over the shoulder like a shawl. Made of laser-cut LDPE and reflective rubberized nylon, the Solar Water Disinfecting Tarpaulin could be laid across a roof or spread out on the ground to allow passive solar heat and ultraviolet radiation to disinfect the water. To read more about this project, which won the Metropolis Next Generation competition in 2008, go here.